What a thing of beauty! 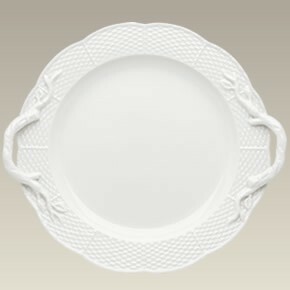 This extra large 13 1/2" porcelain cake plate features a basket weave border and twig shaped handles. Spacious enough to hold a large cake, it is also wonderful to serve cookies, fruit, hors d'oerves, or cheese. Your guests will be so jealous of this showpiece. Made in China, it's dishwasher and microwave safe. This item is a SELECTED SECOND. All sales final.